I’ve been drinking Kombucha, the active ingredient in our Sweet Black Tea series, (moisturizer, eye creme, lip treatment,) for quite some time now with positive results; I have more energy, a more balanced appetite as I swear it curbs my guilty snacking desire and more. Needless to say, I’m a fan. So to add to my growing (no pun intended) “I’m going to grow something” kick which includes nurturing indestructable houseplants, I decided to brew Kombucha. This concoction is a healthful brew of black tea, sugar, and a special “mushroom,” that is called a SCOBY (acronym for Symbiotic Colony of Bacteria and Yeast,) that ferments together over time to create a yummy, tangy, carbonated beverage that contains healthy organic acids that can seriously improve your energy levels, digestion, and provide many other health benefits. Now I say grow because at the end of the brewing process, the mother scoby actually grows, or creates, a new baby scoby you can use or give away! Despite the safe history of home brews for over 2000 years, I didn’t want to be the clueless idiot who screwed it up, a trepidation I admittedly felt. My consolation is that I have historical averages on my side – if I followed directons and kept everything clean, how badly could it go? The first batch where I combined the ‘mother’ scoby, black tea and sugar, the fermentation, which takes usually 5-10 days before happy drinkability, took about 2 weeks thanks to freezing New York end-of-winter weather. It resides on my fridge in a jar, and wow – it’s fun to watch develop. Day 1 it was clear. By day 3, I would shine a light through the tea, and it was cloudy, like the submarine in ocean depths of the Hunt for Red October. Mother scoby was kicking off all sorts of growth, and I saw strands aiming for the surface, where the baby scoby gets created and covers the whole surface of the liquid. So little jar, little baby scoby. Wide jar, wide scoby. 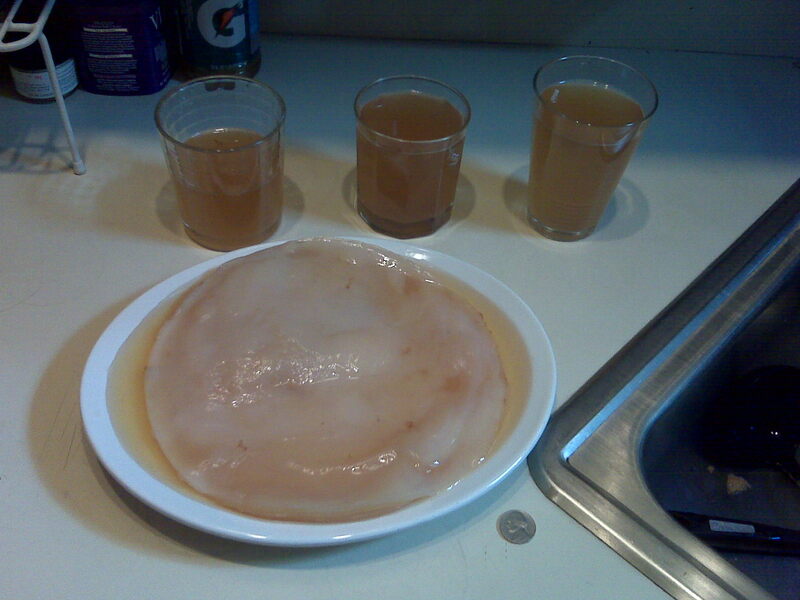 I didn’t think about this when I bought my 2-gallon jar, so now I’m going to get a fantastic scoby the size of a frisbee. Not so aw-how-cute, but definitely woah-huge impressive. Day 5, I notice a film starting to grow at the top, some scary looking discolored yeast/bacteria formations, bubbles and a slightly sourish smell. I thought it was time to panic, thinking something had gone wrong. But after some research, I realize it’s all good and accepted the fact making kombucha was not going to be pretty like watching your chocolate cake batter rise in the oven. But so much more fun. It’s dynamic. Zip to the last day, when air bubbles have formed (like in soda,) baby scoby is a thin film, smooth and tan-cream colored, and it’s ready to go. Voila! As the weather gets warmer (oh finally! ), and so does my apartment, each batch has only taken about a week to fully ferment to bottlable, shareable, yummy drinkable fizzy healthy tea. When it’s done, I bottle it in a GLASS bottle (no plastic, ceramic, metal, etc.) only and keep in fridge to avoid overfermentation/too much gas build if it sits in a heated area for too long (glass shattering has been reported though I’ve never experienced it… oops) and enjoy! I’m now on my 5th batch or so, I’ve lost count, my baby scobies have created new ones, and I’ve gotten requests for my scobies that I’ll gladly give away to proliferate scobies the size of frisbees in my neighborhood. Ideas I’ve gotten to mix the Kombucha with – I like straight, or with apple juice and cranberry juice. So easy to search online on how to make it, and all I have to say is, if I can do it, so can anyone. Give it a go – if nothing else, it makes for great party conversation! To your health! It occurred to me recently that I might not be eating as healthily as I think I am. Random events with free cookies, the candy hand-out at work every now and then, and lattes pepper my diet occasionally…or at least I think they do. So I came up with the idea of keeping track of what I eat. I know a food diary is a pretty common idea for keeping track of what you eat if you’re trying to lose weight, but I never thought to use it just to double check that my eating habits really are as healthy as I think they are. I’ve been keeping my food diary as a spreadsheet on Google Documents (http://docs.google.com/?hl=en&tab=wo) – so that I can fill out the diary anywhere I have access to the internet (home, work, etc.). The beauty of it, I also keep track of my spending habits and exercise habits as well. I’ve been keeping track for a month now, and sugar does tend to find its way into my diet more than I had thought. Now I know, and I’ll be keeping an eye out for sugar. I’ll check back in a month and see if I’ve improved. Or let me know if there’s any other bad habits you think I should keep track of!